Creanova Hosting Solutions Ltd Review 2019: Is Creanova Hosting Solutions Ltd a Good Hosting? Creanova Hosting Solutions Ltd offers excellent prices on servers based in Finland. However, below-average availability and speeds mean only webmasters running a network of small websites will find a home here. Creanova Hosting Solutions Ltd is a web hosting company founded in 1996. It offers shared hosting, VPS, cloud-based VPS, and dedicated hosting plans from servers in Finland. The website is available in English, Finnish, and Russian. Shared hosting plans at Creanova Hosting Solutions Ltd are Linux-based. They come with SSD storage and a below-average 99.85% uptime guarantee — although the SLA does guarantee an average of 99% network availability over the course of the year. Shared hosting plans come with FTP access, PHP, MySQL databases, and cPanel. But at the same time, novice webmasters will find there are no one-click integrations or website builders available. This means that beginners have the functionality they need — but not the support or ease of use available elsewhere to help them build their websites quickly or well. Interestingly, Creanova Hosting Solutions Ltd also features SSH access, cron jobs, daily backups, and compatibility with programming languages like Perl. Sadly, the low uptime guarantee and lack of SSL certificates undercuts the value here as well. Compared to the competition, the overall feature list here is really only advantageous for webmasters who know how to create and manage a website but just happen to be running a small one. VPS plans also come with a free domain. The biggest strength of Creanova’s shared hosting plans is the ratio of databases to websites hosted. The higher-tier plans offer webmasters running a large network of small to medium sized websites the benefits of unlimited MySQL databases and 100 websites. Although the absolute price of these plans is higher than what you will find elsewhere, the relative value to set up this kind of network is excellent. Beginning webmasters will find average value here. The lower-tier plans offer excellent entry-level prices for more than enough disk space and databases to host a small website. However, that is tempered by low memory capacities and the below-average uptime guarantee. Text-based blogs should be fine, but more media-intensive websites will probably struggle. Unfortunately, Creanova really falls short with medium to large websites. No shared plan offers more than 25GB of disk space — far too small for large websites. And even medium-sized websites that can get by with that amount of storage will almost certainly find the 512MB of available memory far too small to do anything with it. The VPS plans fare a little bit better. Discounts are offered on yearly plans, but they suffer from a mismatch between the number of CPU cores offered and the amount of disk space. It’s also worth noting that backup space is capped at significantly less than the available storage — severely undercutting the value. Support options are below average. 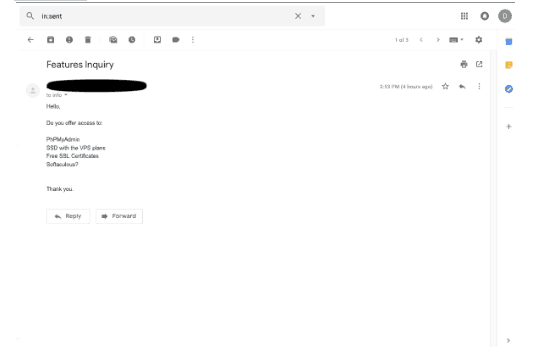 Despite advertising 24/7 support, there is no live chat, phone support hours are listed as only during business hours, and, as you can see from the screenshot below, my email to support — during normal business hours — went unanswered after several hours. Only a very small knowledge base is provided that leaves many questions unanswered. Creanova Hosting Solutions Ltd offers webmasters looking to run a network of smaller websites excellent value. However, beginners as well as owners of medium to large websites will most likely not find a complete package to meet all of their needs. 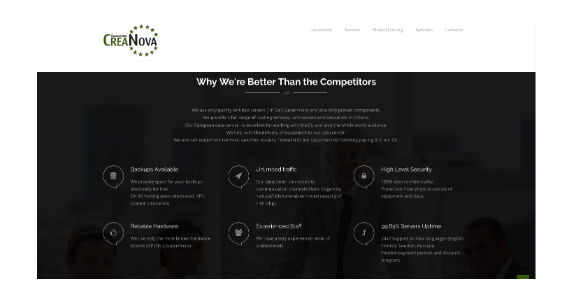 Wondering how Creanova Hosting Solutions Ltd stacks up against other Web Hosting companies? Enter any other Web Hosting company and we will give you a side-by-side comparison.